On the Atlanta campus of SCAD, good style means mixing things up. My shirt. I wear it all the time because it goes with so many different things. It’s a very practical wardrobe item. Pairing with this skirt, I tried to complement the colors in the print. Mixing prints is a fashion statement seen a lot in magazines but not so much on the street. What inspired you to mix prints? Mindy Kaling! She wears and mixes a lot of loud prints that are fun and eye catching. Yet with the silhouettes she chooses, she always looks perfectly put together. It’s a great juxtaposition. Where did you get the pieces you put together? My top and skirt are from J. Crew, my shoes are by Steve Madden and my bracelet is a David Yurman piece. I’m more of a planner. I think about my week and figure out what’s going to work best in both fashion and function for what I have going on. If I’ll be having external meetings, I’ll raise the bar a bit. If I know I’ll be sitting at my desk all day, I’ll choose something more comfortable and casual. Is anything you’re wearing vintage or a family hand-me-down/heirloom? No heirlooms, but a dear friend brought me this wooden bracelet from South Africa. It shows up in a lot of my outfits. 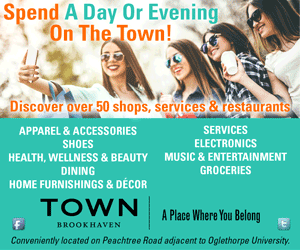 Where is your favorite place to shop intown? I love the shops at Ponce City Market. I’m a regular at Boogaloos Boutique. I also covet Frye boots. They’re pricey, but I like their relaxed style, and the quality is on point. Where do you go for a great bargain? Zara. I find a lot of pieces that mix nicely into my existing wardrobe, and they have such reasonable price points. For shoes, I go to the Steve Madden outlet in Woodstock. They have great styles that are deeply discounted. I wouldn’t call myself a trendsetter. If I see something that inspires me, I try to recreate it. I’m all about following other trendsetters and making sure I know what the thing of the moment is, but I’m definitely not the one setting the trends. Mindy Kaling, of course! I also follow Damsel in Dior and Happily Grey on Instagram. They have an ease to their style. I went through a Mary Kate and Ashley phase during their tween years. Whatever they were wearing, I would copy. Glad that’s over. I really love walking around near Westside Provisions. There are so many galleries and boutiques, and everyone is so stylish. The Westside is just bursting at the seams with homegrown Atlanta style.